Screen sleuth Edmund Lowe is tired of bad movies he makes and quits the biz only to encounter time-honored real murder aboard ship. Sounds better than it turns out, this a Metro B representative of that studio's commit to supply cheapies as second features. MGM was dragged screaming into a double-feature policy, but houses everywhere by the mid-thirties were using them, and you couldn't buck a public's clear preference. A combo by then was generally a good A and soft B, or good B supporting a letdown A. Customers wouldn't complain either way so long as they could plop on (hopefully) cushioned seats for three hours at least. But hold on --- most theatre seats in those days were hard-backed at least --- so it took a champ back, if not backside, to get through long shows. 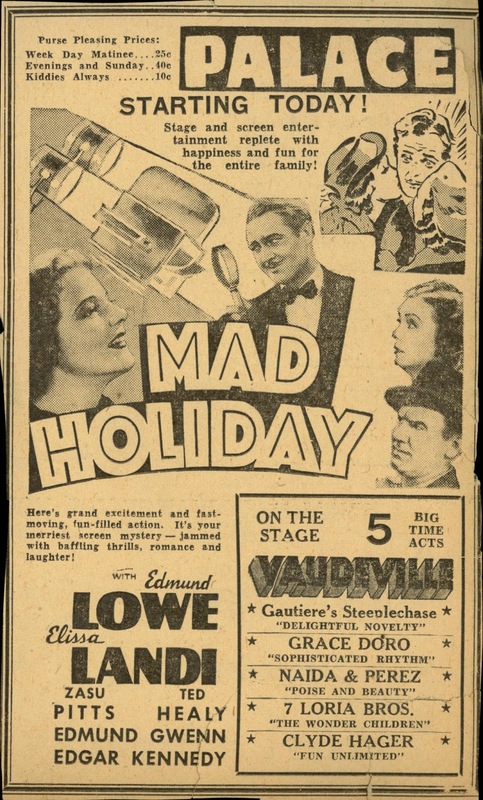 Mad Holiday loaded bases with character folk to assure laughs if not suspense, thus ZaSu Pitts, Edgar Kennedy, Ted Healy (him again), all this dashed with Thin Man-ish flavor. Would murder be taken seriously again after that cycle caught fire? Guess we needed noir, still years down a road, before screen death got renewed impact. Warmed over THIN MAN stuff or not, this looks like a lot of fun. Will have to catch it!